More than 90 percent of the new vehicles sold in 2014 had at least one part made out of a harder, stronger substance than traditional mild steel — and the number of lightweighted parts was likely to grow on many of those, according to analysts from CCC and Ducker Worldwide. Susanna Gotsch of CCC said in a Wednesday webcast on the 2015 Crash Course that lightweighted parts — basically, anything not mild steel — made up 6.2 percent of all the parts fixed or replaced in January through March, up from just 4 percent in 2013. That’s not a huge portion of the tally, but it soon will be. More than 90 percent of the new vehicles bought in America had at least one lightweight part, according to Gotsch, and it won’t be just a single part for long on average. “We will continue to see strong growth in (lightweighting),” Gotsch said. The disconnect between the prevalence of advanced materials at dealership vehicles and their absence from auto body shop jobs exists because Americans more frequently retain older models. That’s likely because of recession and because newer cars are just built better. (Apologies to Hot August Nights.) The average total loss vehicle found in CCC’s records for the first quarter of 2015 was 10.4 years old — more than two years older than a decade ago. The average repairable vehicle in 2005 CCC data was 4.8 years old; by 2013, that car, truck or SUV had reached 6.6 years old — though that fell to 6.5 in the first quarter 2015. Based on this, CCC has theorized that 6.6 years might be the peak. Taking that logic in a vacuum, odds are that by April 2021, you’ll only be fixing the 2015 model year. CCC data points to which parts might be lightweighted first. 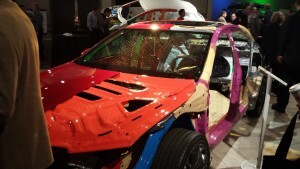 In the first three months of this year, fenders were the most commonly lightweighted part replaced or repaired by auto body shops, with 19.5 percent of the parts being made of something other than mild steel. That was followed by the rear body and floor, at 18.4 percent; the pillars, rocker and floor panels at 17.4 percent; and side loading doors at 15.9 percent. Gotch said that while structural parts were receiving major lightweighting attention, surface parts like fenders and quarter panels weren’t out of the question. The mix of aluminum, steel and “other” in these vehicles has remained relatively constant — but ultra-high-strength steel (typically defined as anything stronger than 780 MPa — three times the limit of traditional mild steel) — has claimed market share since 2013 at the expense of regular high-strength steels. The amount of “other” (probably magnesium and carbon fiber) has crept up slightly, Gotsch noted ominously. “The more weight you want to save, the more likely it’ll cost as well,” he said. Abraham gave the example of hoods, which are already estimated to be 48 percent aluminum in 2015 compared to 22.3 percent in 2009. By 2025, he said, 80 percent of hoods will be aluminum. Other parts like the bumper beams and suspension control arms might fluctuate between high-strength steels and aluminum, according to Abey, who called them “pendulum parts.” However, he said hot stamping keeps steel a “real and compelling” for the bumper beams, and he predicted steel would still dominate doors and trunks. But in general, “parts and materials can swing in any direction,” he said. “The erosion of mild steel is likely to continue,” he said. 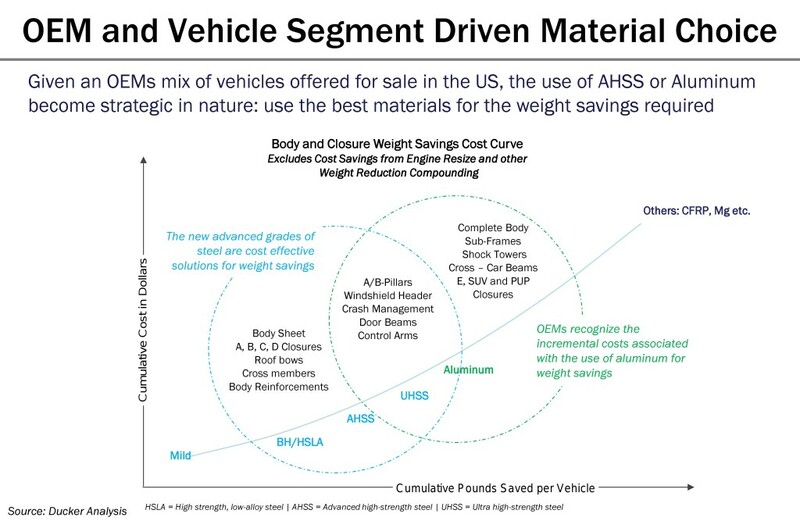 This rise in lightweighting and more complicated materials might not exclude aftermarket manufacturers from the market, Gotsch said, though she estimated there might be a period of more OEM components in the short term. The body and other lightweight panels are more difficult to produce regardless of manufacturer, OEM or not, she said, and OEMs might not have the kind of monopoly they have with items like sensors and airbags. “In some cases, I think that’s going to drive it more than the materials,” she said. That said, repairers preferring OEM parts should have a more tangible reason to refuse an insurer’s suggestion of an aftermarket “cosmetic” part like a closure panel. If it’s made of a lesser grade of steel, a part which looks identical by definition won’t be of “like kind and quality” in weight or strength.